So far, Fall is fantastic! All the animals are healthy, the rotation of pasture is going like clockwork, no escapes, no heartaches. Let’s see…what’s been happening? 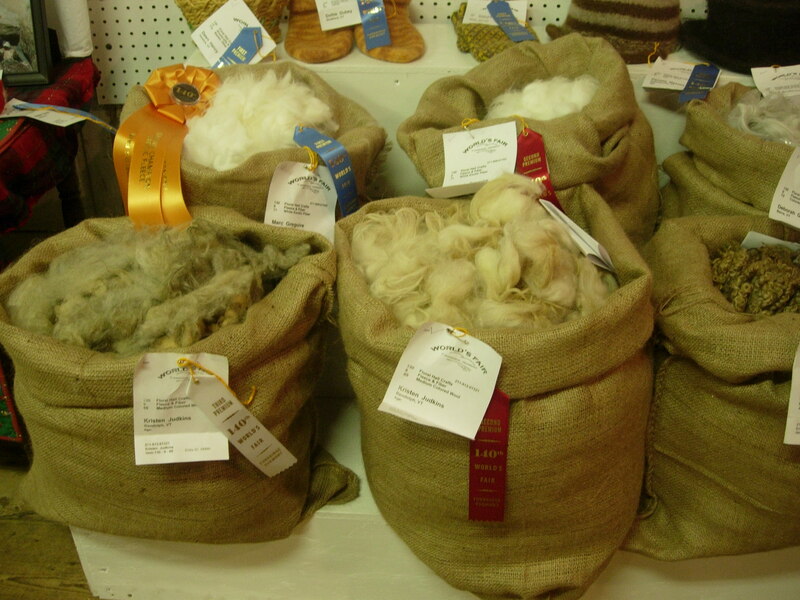 Susie and Anna’s fleeces from the spring shearing got 2nd and 3rd place in the fleece competition at the Tunbridge World’s Fair. I spent a couple of glorious days spinning away in the sheep barn, telling anyone who would listen of the joys of handspinning. Beats working any day. That's Anna on the left, and Susie on the right. 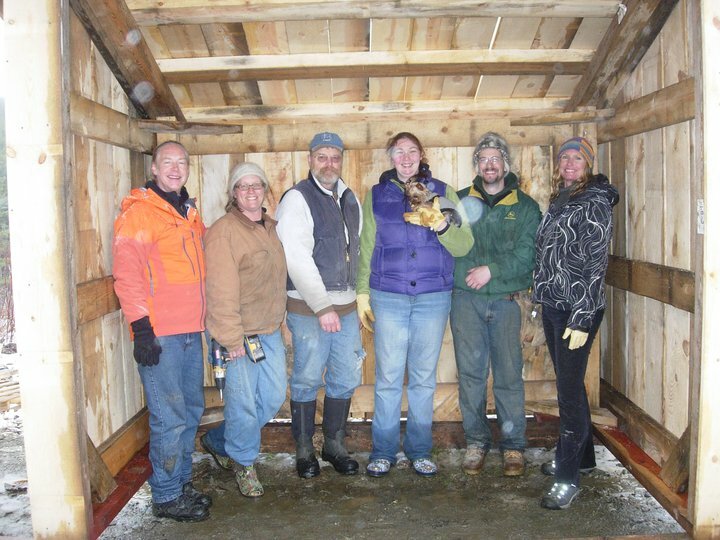 We all took turns at the wood splitter, and split up all the rest of that butternut tree, along with some logs that Alex had generously brought over from clearing their house site. Most of that got stacked even. 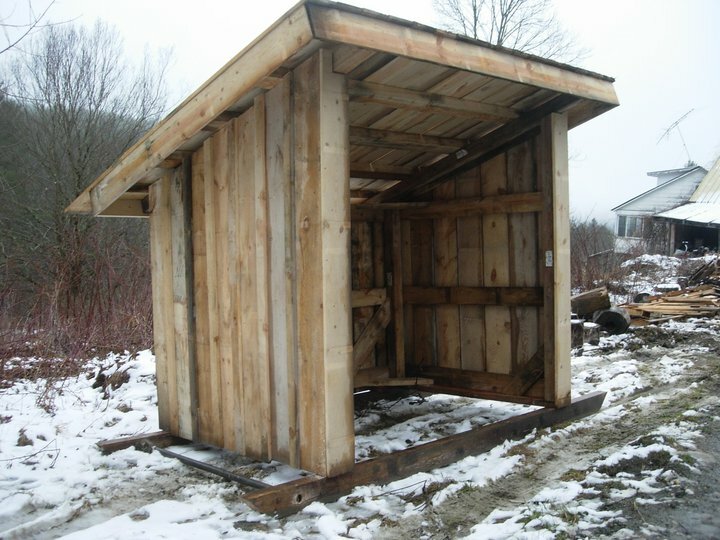 The great news…I think there’s more than enough to get thru this winter, so I won’t have to buy any more wood! Look, it’s not smiling anymore! Happy Labor Day…goodbye and good riddance to this summer! I hope everyone had a great summer, and is enjoying the Labor Day weekend. I, for one, am happy to see this summer go. I haven’t been blogging much, there has been so much happening, and not all of it good, I just haven’t had the words or the heart to write about it here. I continue to be amazed by the support of so many wonderful people, both here in my immediate community, and out there in the virtual community. Without all of you I don’t know how I would have gotten through it all. I’m going to give an abridged version of it here….there is more detail in the threads in my ravelry group http://www.ravelry.com/groups/gilead-fiber-farm. First, my farm had a barberpole worm infestation. I lost Nola to it first, on July 31st, and then one of her kids, Hope, succumbed on Aug. 15th. RIP my beautiful girls. This is a new problem to us in VT, though folks down south have been dealing with it for years. The answer was to move the flock to new pasture, so that I could clean up where the parasites are, and disinfect the barn etc. No problem, I have lots of land, and plenty of net fence, but I had no more shelters, since the buck and ram were in the new shed. Angel number one showed up in the form of a ravelry friend, Gail, who very, very generously bought the farm 3 calf hutches! Actually, now there are 4, as another very generoug ravelry friend, Judy (angel #2), got us another one after Hope passed. I will never be able to thank these 2 women enough, their gifts have enabled me to keep the animals off the nasty infested pasture for most of the summer. 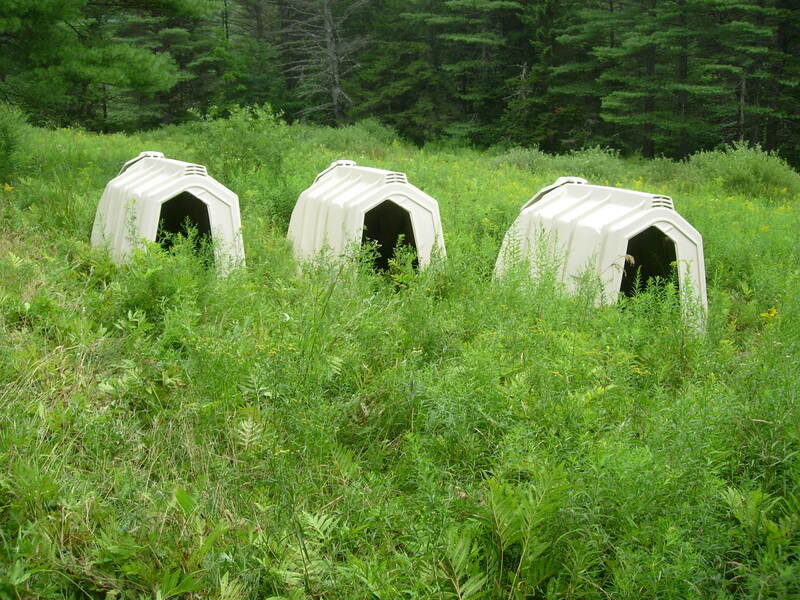 New shelters for the flock! Angel #3 showed up in the form of my dear friend Krysta, who volunteered to come farm sit so I could take a few days off and go to RI to see family and friends, and get a swim in the ocean. She was here, holding Hope when she passed, and saved Lorelei from bloat while I was away. She’s a true hero, not many lambs recover from bloat, but due to her vigilance, sharp eye and willingness to give up her sleep even, Lorelei was nursed back to health, and is doing great. Definitely not the idyllic farm stay that she had envisioned, bottle feeding the orphaned Persy, and massaging sheep bellies, while thrusting nasty goop down her throat was certainly not in her plan. But, she persevered, and is the big hero of the farm, for sure. As you can imagine, I have been hyper vigilant about checking for anemia, scours, or any other signs of off behaviour. Fortunately, the rest of the flock appear to be well, and recovering from the barberpole and anemia. Lorelei and Persy are back out to pasture with the rest of the gang, and doing great, though Persy still doesn’t like the bottle. Thinking that the summer might somehow be saved after getting the animal health and housing issues under control, I was shocked when we then felt the earthquake a while ago. And then that was quickly put out of mind by Hurricane Irene, last Sunday, which devastated my community, in addition to so much of the state. My farm and my flock are fine, we sustained no damage or injury, but we were stranded without a road out for 24 hours, no electricity for 5 days, and still have no phone service, or cell service. I type this via satellite. I am incredibly lucky. 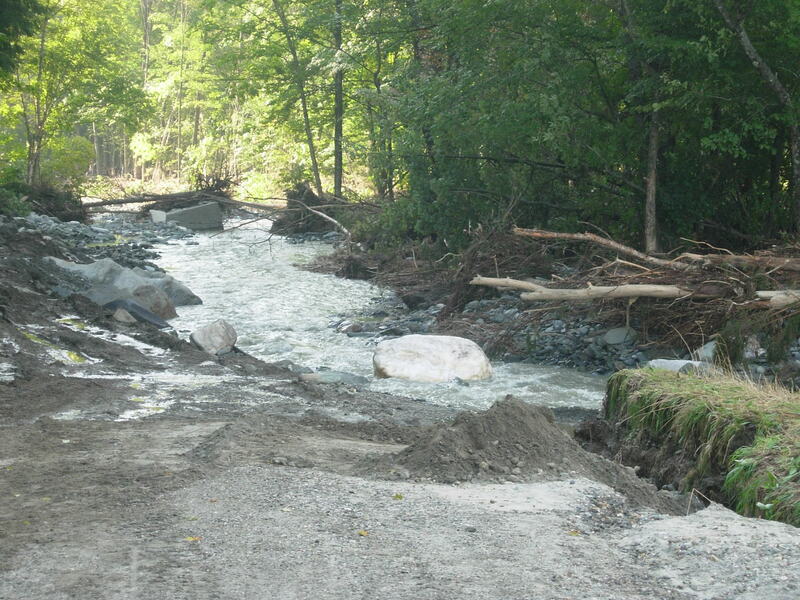 My road on Tuesday, post Irene, the brook is running down it. There has been so much destruction, and devastation all over VT that it is shocking, my mind reels, and I weep as I travel around (as much as you can travel, many roads and bridges are gone). But the indomitable Yankee spirit, and sense of community all around VT has been something to behold. People really pull together and help each other out. Our road is passable, and we have electricity thanks to local guys who have heavy equipment, who got out there right away, and have been working non stop since Monday rebuilding the road, and bridges, to enable the utility and phone crews to get up here. The volunteer effort has been phenomenal, though there is still much rebuilding to be done before snow flies. I apologize for the spotty nature of this post, and I have so much more to say about all of these happenings, so if you want more details about anything, just ask. In the meantime, I hope that Fall will be long and gentle, and allow for the rebuilding of infrastructure around the hurricane damaged areas in VT and beyond. Be safe, be well, and most importantly, be happy everyone. First off, let me just say that things have been crazy busy in my life the last few weeks, hence the delay in posting. There’s been a lot going on, from adding new animals, to house guests who totally redid my kitchen, living room and dining area. A few weeks ago, I took a day trip down to CT to Harlequin Farm, to pick up my new Finn sheep. I got a yearling ram, named Skippyjon, and 12 week old ewe, named Lorelei. They are a breeding pair, and the start of my flock of registered Finns. 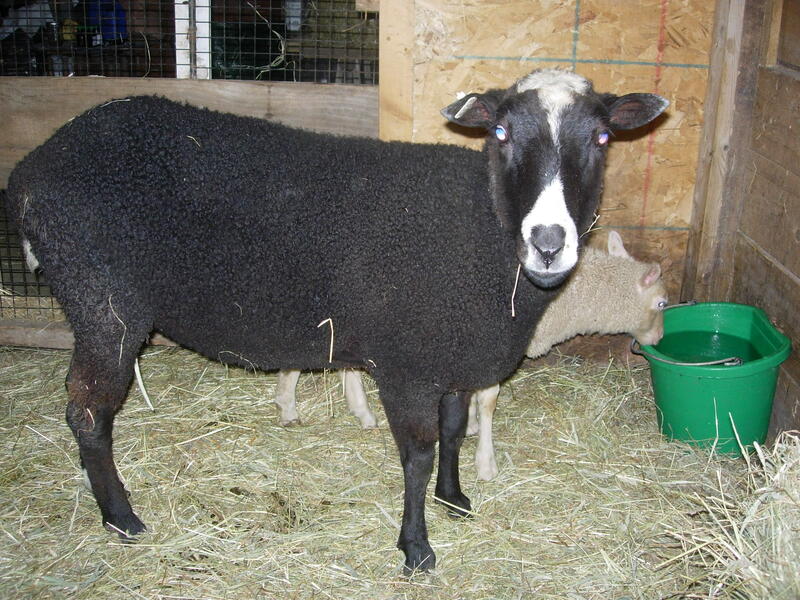 I’ll also breed my shetland ewes to this ram, as my very favorite fleece to work with so far was a shetland/finn cross from Harlequin Farm. These are the friendliest sheep ever, they come when you call their names, like dogs. Skippyjon walks on a lead beautifully, Lorelei, not so much 🙂 They have been introduced to the rest of the flock, and everyone is getting along very well. I’ve been trying to separate Skippyjon and Four from the girls, but they keep breaking out of the boy pasture. So, for now, they are happily cohabitating, and I’m nervous about lambing in January. This afternoon I hope to fix the short in the electric fence and try again. But, either way, these new sheep are the beginning of my flock of registered Finns, and I can’t wait to see all the colored lambs next year. On the kid front, all the kids are doing great! This shot of Promise captures a rare moment of inactivity. They are tough to photograph as they are so so fast, all my pics come out blurry. But, I can report that they have all had their first hoof trimmings, FAMACHA checks (all 5s still, yay!) and Persy’s boy bits have fallen off (he was banded a few weeks ago) so he’s officially a wether now. Hope and Persy have been being fed well and they are just about as big as Promise now, go Nola! They are all growing strong, swift and unbelievably cute. It’s a wonder I can get anything done around here at all. my kitchen got a new look! Other very exciting news is that my house got a redo! My dear friends Kirah, Kathleen and Eileen came up for a girls weekend at the end of June, for what I thought was a weekend of thrift store shopping, cooking and wine drinking, and they totally surprised me by making over my house. I met them in Boston on a Wednesday for a Red Sox game, then we went up to Rockport for a lobster dinner. We came back up to VT on Thursday, and I had to work on Friday. While I was at work, they got to work. They took every single thing out of my kitchen, cleaned the floor, walls, shelves, cabinets, appliances, everything. Then they painted all my cupboards, and washed the windows. When I got home from work, it was like a new kitchen! They reorganized my pantry and cupboards, it was amazing to come home to that. Then they continued all weekend, for 3 full days, they steam cleaned, they rearranged furniture, washed walls and windows, rehung my artwork, a total redo. They inspired my neighbor Aaron to finally come fix my dishwasher too, I’ve been waiting for that for over a year. They even manifested a new red couch! The new red couch is awesome! This was a huge, huge, huge gift! 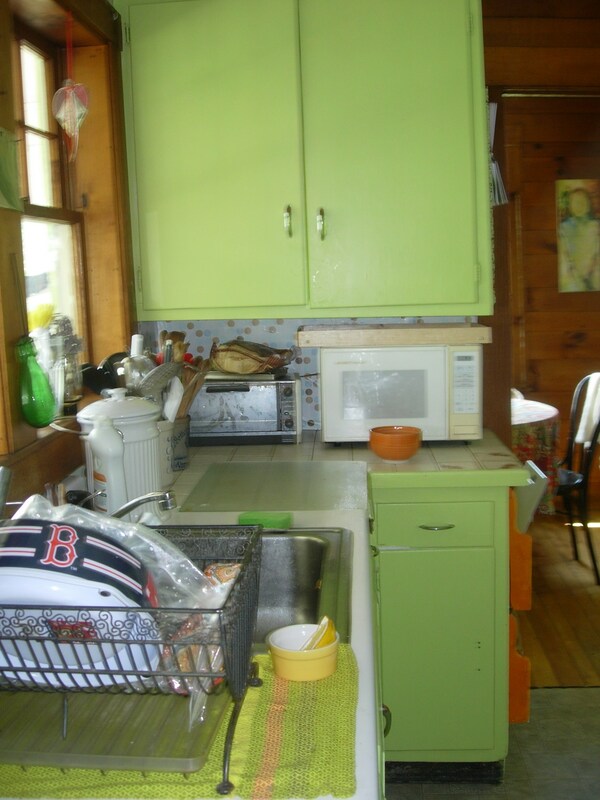 My kitchen is tiny, and it was gross, filthy, greasy, mismatched cabinets, ugly, ugly wallpaper. Now it’s clean and bright and cheery, and it helps me be motivated enough to cook decent meals for myself, which is big stuff for me. I can’t thank you ladies enough! 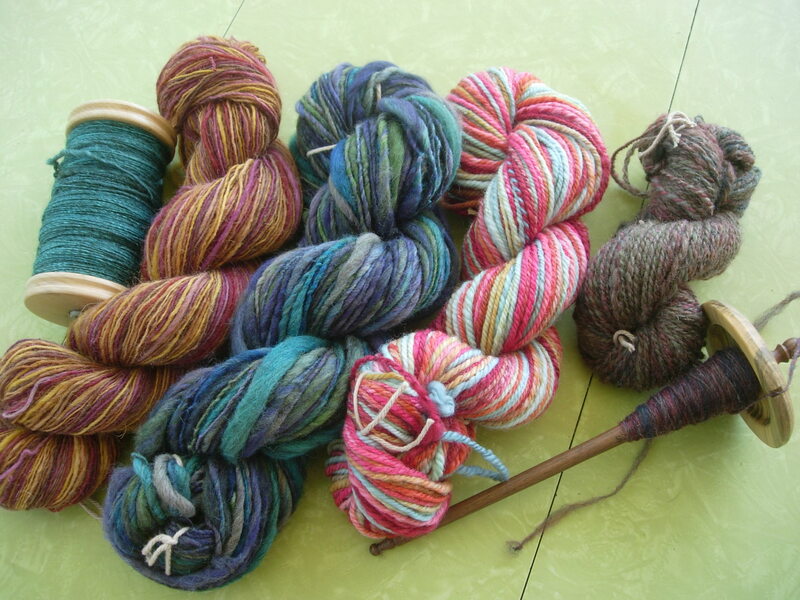 I’ll continue to spin daily and hope to burn thru some of my ginormous fiber stash. Daily updates are on ravelry for those of you who are interested. Overall, things are moving along in a positive direction here at Gilead Fiber Farm. I have amazing friends and support from all over, and that’s what keeps me going. Well, that and the amazing flock of cuties that live out in my pastures, I love my critters like children. Now, I’m off to find that short in my fenceline and enjoy some sunshine. Kidding is Finished, and other news…. 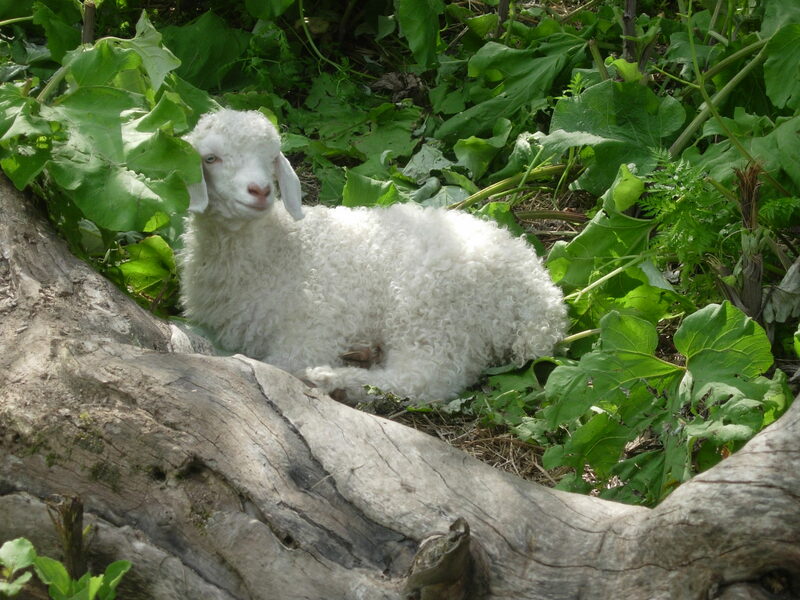 Tallulah had her single doeling on Tuesday May31st. She waited until all the company had left and I had gone back to work. I guess my girls like their privacy. I came home to a huge doeling, she’s bigger than either of Nola’s twins. I’ve finally settled on names as well. 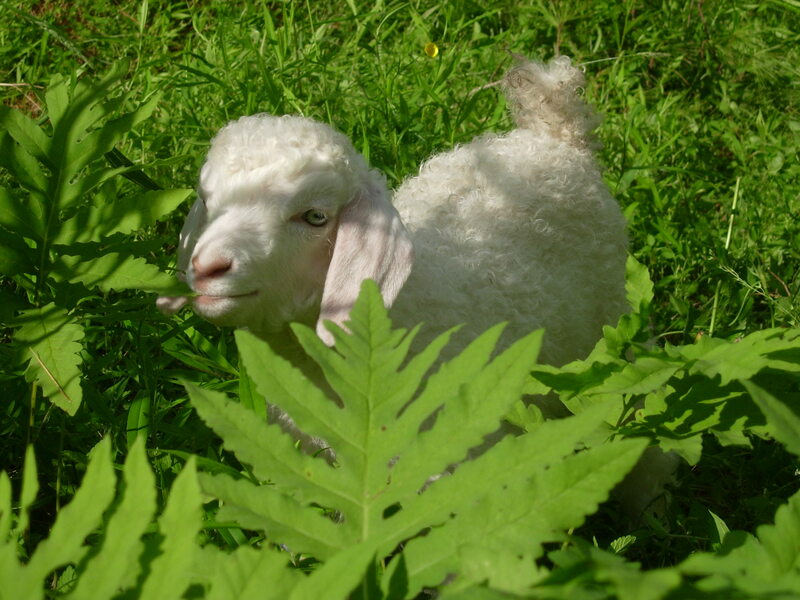 Tallulah’s doeling is Promise, aka Missy, and Nola’s twins are Hope and Persistence or Persy. I thought since they are first kids born on my farm, they ought to have names with some heart, and these just resonated with me, and the goats seem to like them better than the gangster names I had picked out. Here’s the first video of the 3 romping around in the nursery stall, they are so dang cute I can hardly tear myself away from the barn. It’s all I can do to get anything done at all. 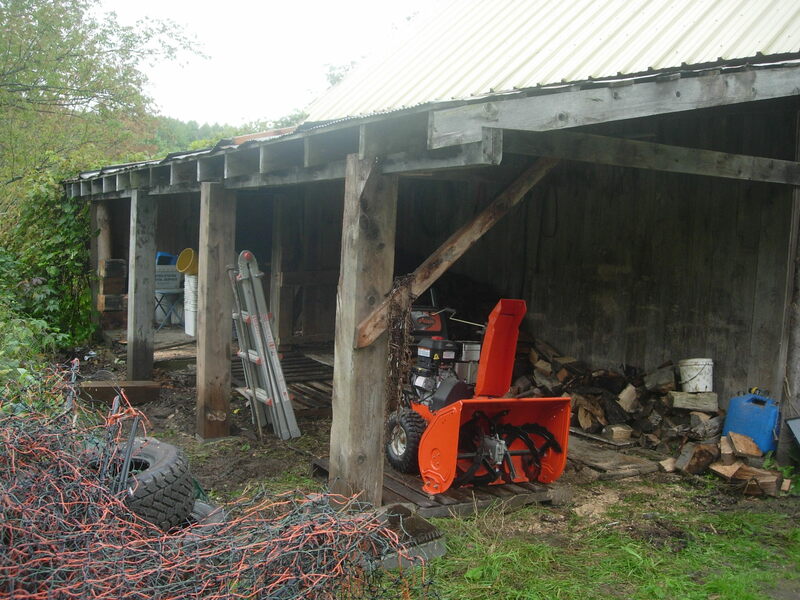 In other farm news, my neighbor Ernie came over today with his big tractor and lugged my newly built shed down to the pasture where it can actually start getting used. Yes, it’s a very exciting day around here, and long coming. 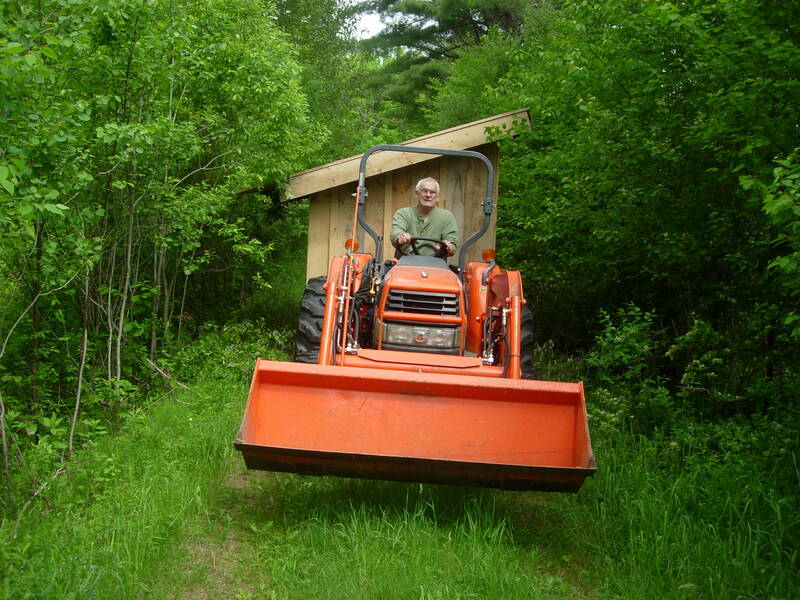 Ernie hauling the new shed down the access road.TaDa! It started pouring rain before I could go set up the fence, so that’s my task for this week after work. That, and cleaning out the lower barn, to get ready for the mamas and kids to go back out to pasture. Unfortunately, I must announce that the Intro to Shamanism Workshop, scheduled for next weekend June 11/12th is cancelled, due to lack of participants. We’ll try to reschedule for later in the summer or this fall, so if you have interest but those dates didn’t work for you, please let me know so you can be included in the new date poll. More kid photos to come. I just got the call, so I’m off to get some hay. Happy Sunday everyone! First kids have arrived at Gilead Fiber Farm! 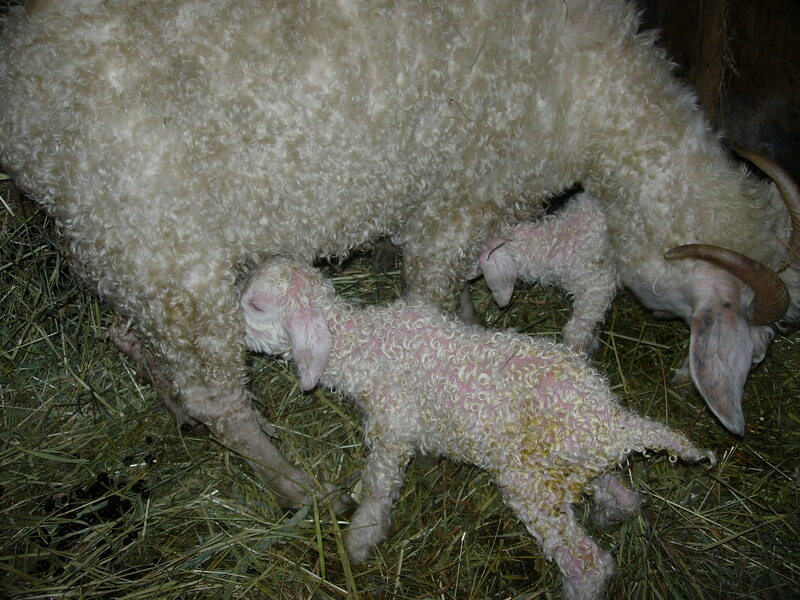 It’s finally happened, the long awaited birth of the first kids on the farm! 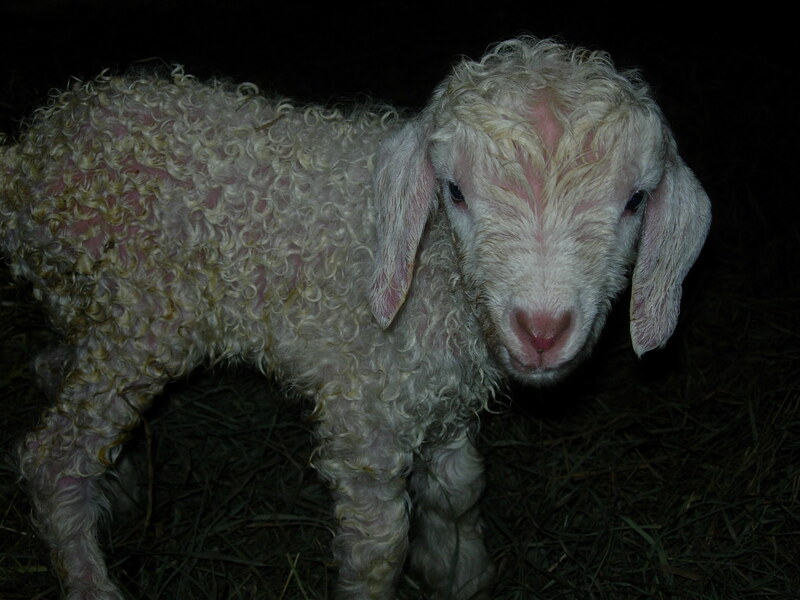 They were born yesterday, with no help at all. I came home from work yesterday and there they were…all cleaned up and walking around cute as could be. Amazing! I have been anxiously awaiting the freshening, in fact, my friend Adrienne had been here visiting all week long, in the hopes of capturing the birth on film. She even stayed an extra day, and as soon as she left, there they were. Sorry Adrienne, but thanks so much for being here and holding my hand. Both babies and Nola are doing great. They are nursing well, and Nola has figured out how to be a Mama. I’m so happy and relieved. These kids may be the cutest creatures I have ever seen. It’s so much fun to watch them exploring the world, they’re already trying to jump, but their little legs aren’t so coordinated yet so they do alot of flopping around, which is hysterical. I’m not sure how I’ll get anything done around here this weekend, between the wild weather and the new kids. Tallulah is still waiting to kid, I think she’ll have a single, hopefully in the next day or two, she was bred just a couple of days after Nola. She’s up in the kidding stall with Nola and the kids, and she’s being very sweet with them. Nola and her kids, learning to nurse. Also, in a few weeks I’ll be heading down to Harlequin Farm in CT to pick up a couple of Finn sheep, a ram and a ewe, Skippyjon and Lorelei. I’ve been wanting Finns since before I even got my goats, so I’m super excited about them. I’ll start breeding them in the Fall, and I’ll breed my shetland ewes to Skippyjon too. Finn wool is my favorite wool to spin, and I once got a gorgeous Finn/Shetland lamb fleece from them that was the nices fleece I’ve ever worked with. I’m looking forward to my own home grown Finn next year. 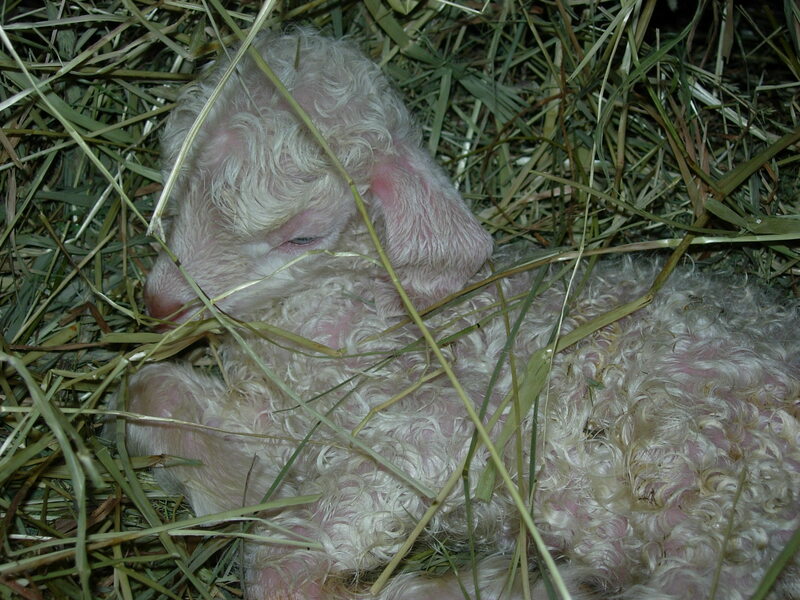 Births on the farm at last! Now I think I can call myself a real farmer, and it feels so right. There will be many more kid photos to come. 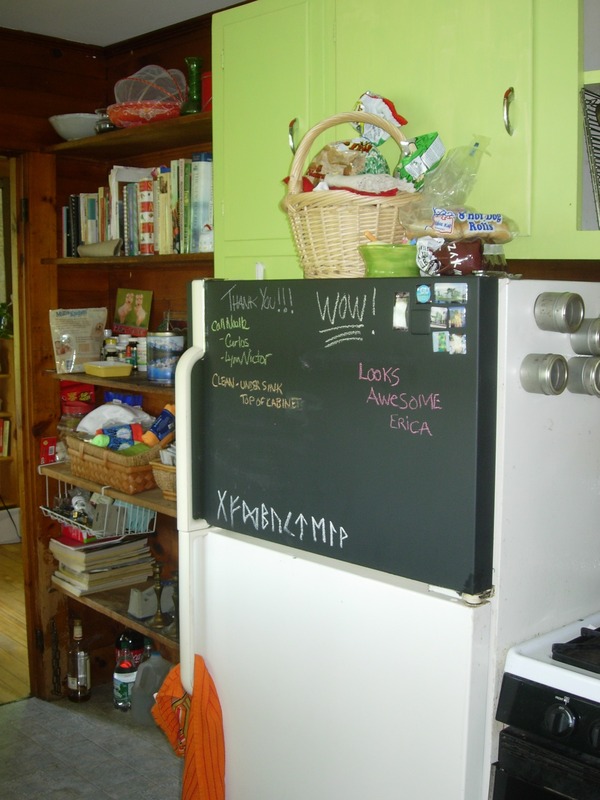 Announcing the first summer workshop at the Farm! Some of you readers who are not on ravelry may not have heard the rumblings about this. We’ve been chatting over there about shamanism, and using some of the ancient practices to help guide us, and bring us more peace and healing. I think we can all agree that everyone on the planet could benefit from that these days. At last I can announce that the Introduction to Shamanism workshop is on at the farm. I’m so excited to be able to bring Evie and Allie to the farm for this, what a treat. Special thanks to Dianna Branson for making the introductions and getting the conversation started. No prerequisite is necessary. Shamanic Journey Process is an introductory workshop. The ability to journey is necessary for most of the Spirit Passages workshops. • A notebook and pen to record your journeys. • A large bandanna or blindfold for your eyes. • A bag lunch and water to drink for each day. • A few small personal items to be incorporated into an effigy to our fiber foremothers. Cost is $100 per person for the 2 day workshop. We’ll need at least 10 people to sign up to make it happen, but can accomodate more than that happily. You are welcome to camp out at the Farm if you are inclined that way. 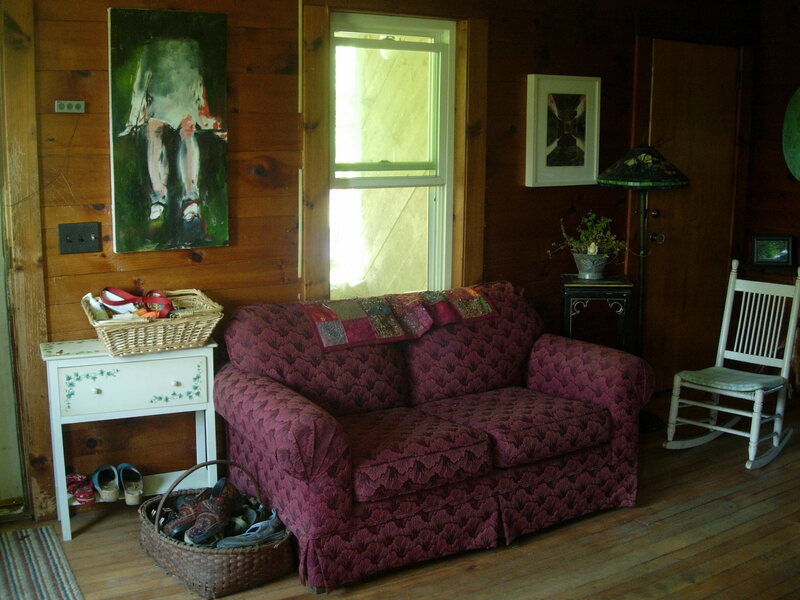 Otherwise, there is a nice B&B a few miles from the farm with very reasonable rates Nestled Inn. There are other larger chain hotels in White River Junction or Barre/Montpelier, but they are about a 30-40 minute drive away. To register, please email me at countryelvis4@hotmail.com.